Mineola, NY - Nassau County Executive Edward P. Mangano, Hempstead Town Supervisor Kate Murray, Oyster Bay Town Supervisor John Venditto, North Hempstead Town Supervisor Judi Bosworth, Glen Cove Mayor Reginald Spinello, Long Beach City Manager Jack Schnirman and Westbury Village Mayor Peter Cavallaro, President of the Nassau County Village Officials Association (NCVOA) today announced a joint response to Mother Nature’s destruction of our roadways. Under a new aggressive Countywide Pothole Repair Plan, municipalities will share reported pothole complaints in “real-time” so that highway crews can be dispatched to address road conditions with urgency. North Hempstead Town Supervisor Judi Bosworth stated, “Inter-municipal coordination is critical to efficient government especially when it comes to repairing potholes, which can damage our vehicles and be a hazard for pedestrians. We will continue to communicate with Nassau County, New York State and the Villages in our Town to share information on pothole locations so that they are addressed as soon as possible. The Town will continue its promise of filling potholes about which we are notified within 2 business days." 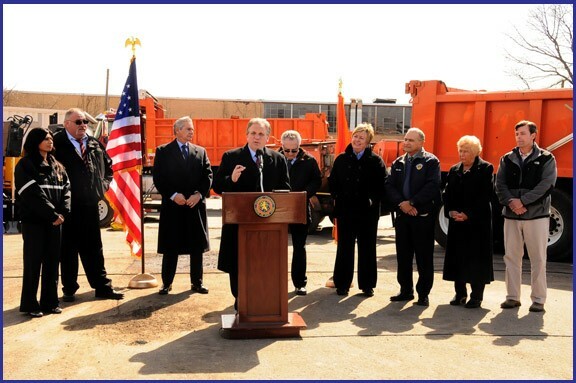 ⇐PreviousLEGISLATOR KENNEDY ANNOUNCES NEW POTHOLE REPAIR INITIATIVENext⇒Create a Safety Profile for "Smart911" Today!